Lake Havasu, water recreation is practiced by the devoted all year long. A unique feature of this exceptional park is that you can travel to 150 boat-access only campsites along the shore of Lake Havasu between Cattail Cove and Windsor Beach. The scenic shoreline of Lake Havasu State Park is an ideal place to enjoy beautiful beaches, nature trails, boat ramps and campsites. 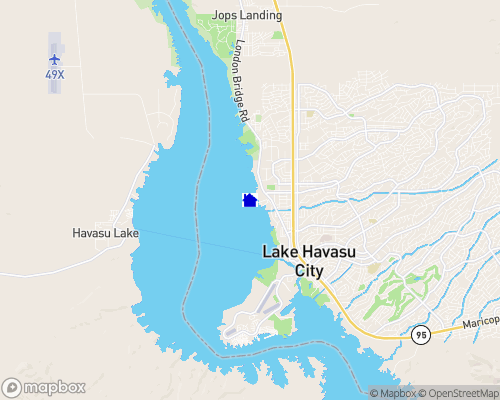 Lake Havasu State Park has two distinct units, Windsor Beach and Cattail Cove. Windsor Beach is a wonderfully developed area in Lake Havasu City just north of the famed London Bridge. (London Bridge was dismantled at its original site in England and rebuilt in Arizona by developer Robert McCulloch in 1971) Windsor Beach is popular for day use, camping and launching all varieties of watercraft. The park offers 75 drive-in campsites plus 55 boat-in sites. The restrooms and showers are handicapped accessible. Lake Havasu is in Arizona and in California...it is really the huge widening of the Colorado River...water is absolutely clear...used for drinking water to California...It is an oasis in the middle of the Mohave Desert that features great power boating, sailing, jet skiing and all aquatic sports...there is even an aquatics center for winter time fun...with a wave pool, spa, slide, etc. The lake is about 20 miles long and goes from Lake Havasu City, AZ to Parker Dam, AZ. The lever does not vary more than a foot during the year. There are boat docks, ramps, marinas. It is a lake that hosts many events, such as the World Jet Ski Races in October. And it is being discovered by the world as you read this. Lake Havasu City is a Mecca for both tourists and new arrivals, alike. The warm, dry air allows one to swim in the lake sometimes from May to October, depending on the temperature. We can't forget what put it on the map...The London Bridge...yes THE London Bridge...the one you used to sing about...when it was "falling down" a dreamer named McCulloch brought the bridge, piece by piece, from London to Lake Havasu...along side the famous bridge is the beloved "English Village" with lots of shops, the marina, swimming and the best swimsuit sightseeing in the world.